It is a fact that a lot of people around Toby Knapp‘s projects are mainly searching for this very specific vibe that he offered under the ONWARD moniker. NECRYTIS is actually the project that let former ONWARD main man to re-discover some of his very important influences again. With their “Countersighns” debut, NECRYTIS managed to make quite an impact on the underground universe. Now, not even one year later, their second output “Dread En Ruin” is completed. So we can point it for sure: NECRYTIS are back. 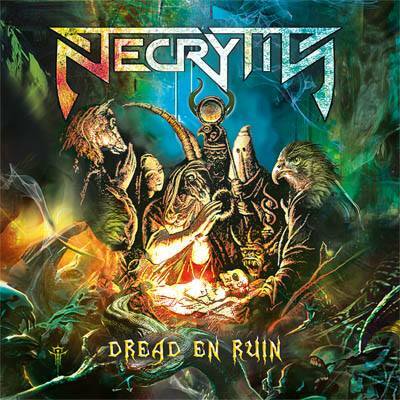 If you are mainly focusing into the Melodic side of US Power Metal then NECRYTIS are for you. Although I must point that the new material is approached under a more Progressive prism, compared to the debut.There are still plenty of influences to be discovered in here under the main QUEENSRYCHE/early FATES WARNING basis. Traditional and NWOBHM touches are spread around the album’s compositions, making the final result ev​en more interesting musically. And yes, allow me to point it before you ask: ​the influence of Onward can be heard everywhere. Go for the album and play it loud. “Starshine” is one of the best songs released this year.